When Colón, better knows as Columbus, on October the 11th in 1492 set foot on – what he believed to be India, but was in fact one of the Bahama islands – he witnessed a totally new world. People with ‘red’ skins, to be called Indians and above all an overwhelming natural world described in his letters back home to the Spanish King as refound Paradise. And not just wanting to make a good impression on the King that the expensive expedition was well spent money, but he was really impressed by the abundance of nature. 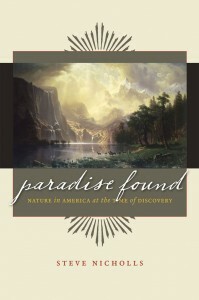 Steve Nicholls, a producer of award winning nature documentaries for more than 20 years, with a PhD in entomology, wrote an impressive book (“Paradise found”) on the abundance of life in pre-Colombian North America and about the sad story of its massive destruction in the centuries that followed. To me it proved to be a nearly 500 pages-thick page turner, exceptionally well written, giving beautiful descriptions about the abundance of Pre-Columbian life from the Atlantic Ocean to the Pacific and everything in between, from the Caribbean archipelago, the monumental forests, untamed rivers, Rocky mountains to the great plains. His book is very relevant in the discussion about what Europe looked like before the impact of man. In the USA there is a documented case of the ‘shifting baseline syndrome’ and Nicholls describes it into detail. One of the main ideas behind Rewilding Europe is to restore wildlife and the abundance of life in Europe. Sadly we haven’t got accurate descriptions of pre-modern man Europe and therefore a lot debate. Chauvet, Lascaux and Altamira and other ancient sources as well as results from the latest research give us clues, but little hard evidence on the numbers of animals that once roamed the European plains. The book of Steve Nicholls does so for North America. There are hard population numbers to be found: for Atlantic cod, beaver, whales, turtles, deer, bison and salmon to name a few. There’s one thing to the book, though: it is nearly 500 pages, but zero pictures… The good news however, is that a TV-series about the book is being made. Apart from an astonishing story about the abundance of pre-Columbian life in America it’s also a sad story. Billions of passenger pigeons were slaughtered in a couple of decades into extinction, the same goes for numerous other species. Buffalo nearly shared the same fate: from herds of many millions that took several days to pass in the early 1800’s, to near-extinction, in just a couple of decades. In 1902 only 22 animals survived as wild animals in the young Yellowstone National Park (as well as a few animals in captivity in private herds). These herds have grown, but their territories are nothing compared with the great plains on which they once roamed. Now and again there’s good news in the book as well. It describes the first initiatives to preserve wildlife and wild landscapes and for example how very complex and expensive measures are being taken to restore part of the Everglades in Florida, quite intact until the 1920’s but heavily disturbed since. In his book Nicholls distinguishes several ways to die out: a species can go economically extinct when there’s no money to be made anymore. Cod on the Atlantic Grand Banks are an example, as well as salmon fishing on the East-Coast rivers or beaver-hunting for fur. In general long before a species loses its economical value, it will go ecological extinct: the influence in the ecosystems has become marginal. And of course a species can really go extinct, with the passenger pigeon as a well-described example in the book. There must have been billions of these birds. One of the actually measured breading colonies measured thirty to forty miles long and three to six miles wide! The slaughtering of this species on one point had taken industrial proportions with trains carrying of millions of them to the hungry population of fast growing towns such as New York. The last passenger bird called Martha died in the Cincinnati Zoo September in 1914. It’s a story too well known for numerous other species as well. One of the astonishing details in the book however is what I’ve come to call as ‘Lazarus’-species: species supposed to have gone extinct but turning up again in some forgotten corner of the US. There are quite a few in the book, sometimes still not being clear whether or not a species has really returned from the dead, such as with the Ivory billed woodpecker. And again, maybe there’s no such thing as definitely extinct, since at this time serious attempts are being made to revive the passenger pigeon. Nicholls describes that you might be successful in reviving a species as such, but that’s another thing from have an ecologically functioning population of a species again. Nicholls describes the diversity of the numerous Indian nations that existed throughout America as well. Each of these nations had their own impact on their surroundings, whether in hunting beaver, catching oyster, fish or shooting buffalo. These different Indian nations managed nature by planting preferential trees and burning sub-growth in forests and thereby promoting the hunting and agricultural species they preferred. Since they kind of ‘owned’ their hunting grounds, they never took too many. Nicholls describes that the Indians performed a kind of modern wildlife population management: harvesting enough for themselves, but not to the point of local extinction of a species. By burning undergrowth in bush the made sure deer could be seen and hunted. So, no ‘Wild West’ at all, but a ‘Managed West’. According to one of the chiefs quoted in the book the Wild West only began after ‘white man’ stopped managing nature as the Indians did, with an explosion of undergrowth in forests as a result. Europeans also brought unknown bacteria and viruses. In many cases, long before actual encounters between Indians and Europeans the Indian nations had collapsed on European diseases, since apparently the viruses travelled faster. Part of the abundance of wildlife in some areas was probably due to the fact that Indian wildlife-management already had collapsed by the time the Europeans arrived. The last chapter of the book is reserved for the wolf. In the hunting of the wolf, to near extinction, an echo of the European past of the new inhabitants of the US sounds through. Where other species such as beaver, bison, salmon, leatherback turtle or cod were (nearly) driven to extinction for economic purposes, it’s another story with the wolf. The battle was fought as if against the devil itself. A national campaign against the wolf proved very successful. It distinguished from 48 states with exception of the so-called ‘last wolves’: the nearly mythical individuals, who could not be tracked down. One such late wolf, named the ‘Custer Wolf’ alone was held responsible for the killing of five hundred horses, cows and calves and got a ‘bounty’ on his head of $ 500,-. Being protected by the Endangered Species Act of 1974 the wolf is now slowly on its way back after being re-introduced in Yellowstone in 1995. The reintroduction proved so successful that the wolf is delisted from ESA and just months after the delisting hundred wolves had been shot again. So also in the US the battle isn’t over yet. At the end Nicholls goes into strategies for effectively protecting nature and comes to the conclusion (very shortly summarized) that privately owned reserves and wildlife in the end might be a better solution than commonly owned nature, with fishing reserves as an example. Food for discussion.